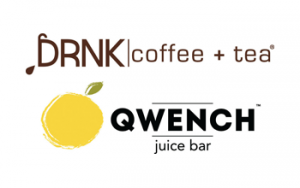 DRNK coffee + tea and QWENCH juice bar are more than a trend ... they are a future. For this very reason, we're awarding franchises only to individuals and organizations that possess the highest personal and professional qualifications. To say the future is bright would be an understatement. DRNK coffee + tea is a growing franchise built for long-term growth. We invest great efforts into research and development, making sure we’re way ahead of the curve. Our goal is to constantly re-invent ourselves as leaders in the specialty coffee space. We’re consistently in the lab testing new products forecasting the next big hit! This culture carries to our marketing strategies and operations support. The latest technologies are always tested at a corporate level, ensuring added value to be implemented across the system. Our operations team is built to be hands on with franchisees! We spend two weeks training franchisees in Hollywood, CA and spend at least one week training staff at the franchisee’s location. 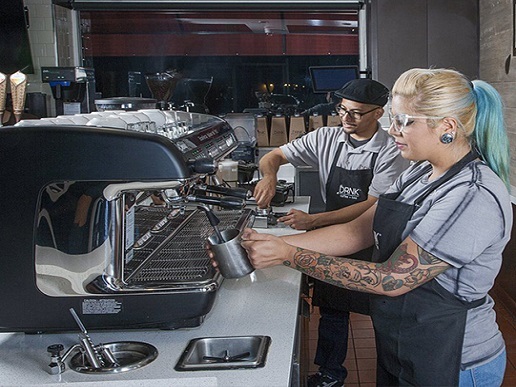 Our in-depth program helps franchisees understand day-to-day operations including customer service, overseeing cost of goods, labor, hiring and maintaining equipment. When it comes to operations, we’re very serious about supporting our franchisees. We want to ensure a comfortable store environment for both our partners and their customers. Our training team will be available for ongoing support and new product introductions. Quarterly franchise meetings allow franchisees to get updated on new products, training and new programs. DRNK coffee + tea’s marketing is designed to be hyper-focused on the local trade area. Our marketing team works hand-in-hand with franchisees in developing Grand Opening campaigns, so that the neighborhood immediately feels the presence of newest coffee shop in town! To drive traffic to the stores we direct our efforts in guiding you to implement a variety of marketing tactics and the development of a Local Store Marketing plan which includes proven tactics such as on-site sampling, direct mail campaigns, bounce back coupons, loyalty programs and more. However, we’re different than most QSR franchise organizations. We’re investing major efforts into modern marketing tactics such as geo-focused content marketing in the form of blogging and of course taking advantage of the wide but targeted reach social media has on all platforms. Bottom line, a well-executed marketing plan added to our on-going LTO and product offerings and continued support equals a successful DRNK coffee + tea. Sufficient capitalization: Minimum net worth of $500K, with liquid assets of at least $150K.